Family members of disappeared persons across Sri Lanka came together and shared their stories of struggle and suffering on the International Day of the Disappeared. Their words evinced unity, formed through immeasurable pain, between Sri Lankans of the North and South who have had family members become victims of enforced disappearances over the decades. 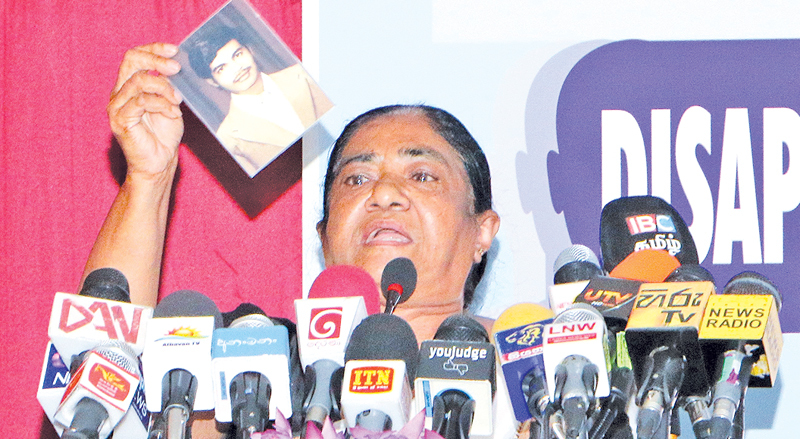 “For twenty years, I have been waiting for the arrival of my son,”said Visaka Dharmadasa, who is the mother of a soldier who went missing in action. “There is a clear difference between a person that is missing and a person that is killed,” she said.She explained how difficult it is to cope with a disappearance, split between the hope of finding him and the anticipated agony of his confirming that he is gone forever. “Sometimes, I go following a young person on the street, thinking he is my son,” she said. “When I went abroad, I thought I might find my son. I am always suffering.” Shain Shaibunnisha came from Puttalam to bring attention to her brother’s disappearance. Hewas just 17 years old when he was kidnapped by the LTTE 30 years ago. Families from the South shared similar sentiments. Anula Ariyavathi spoke of experiencing intimidation tactics and sexual harassment when she went searching for answers regarding a missing family member in Matara. “There was no one to help us, there was no one to provide us with any answers,” she said. Amidst their emotional struggle, Anula’s family suffered financially too. “We had to bear the full responsibility of being the head of the household, there was no one to give us even a 1,000 rupees,” she said. Hundreds of family members attended the Office of Missing Persons’(OMP) event, but for Yogendran Veena, who is missing a family member from Batticaloa, such acts of solidarity and remembrance can only go so far.